In the spectrum of movies about alien/human combat, you have District 9 on the high end and Battle: Los Angeles on the low end. (Starship Troopers can go a variety of places, depending on your point of view.) 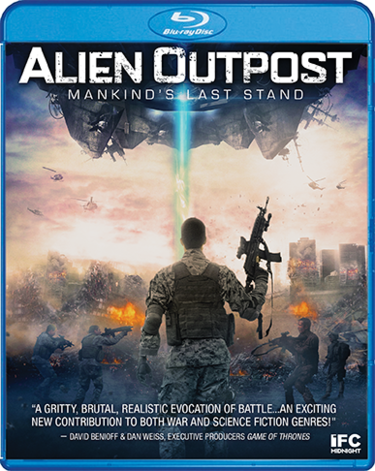 Alien Outpost, on Blu-Ray from Scream Factory, uses a faux documentary format to tell its story. That's just enough of a spin to make the film marginally engaging, even if it ultimately falls somewhere in the middle of the scale. The premise is that Earth was invaded by aliens, dubbed “Heavies,” in the year 2021. A year later, they retreated, leaving a few thousand of their warriors behind. Outposts were created to destroy the remaining Heavies, and a decade later, only a few are still operational. A documentary crew follows two soldiers as they make their way to one of them, Outpost 37. Not long after arriving, they discover that some of their hostile foes continue to lurk in the area. One of the men is captured, so a rescue mission is launched. This evolves into a major battle that takes a significant toll not only on the outpost itself, but also on the men who must fight these ruthless creatures while underfunded and undersupported. Part of what makes Alien Outpost interesting is that it's an independent film. The budget was presumably pretty low, yet the movie has been made with genuine skill. Visual effects are largely done practically, which was an excellent choice, in that it gives the cast something concrete to work against. The mockumentary approach also lends the movie a sense of urgency that creates suspense in key scenes. Unlike some similar pictures, the combat feels authentic. The actors aren't participating in over-the-top stunts; instead, they go through maneuvers that real soldiers would use. On an action level, Alien Outpost certainly offers a good time. There are pitfalls, however, some of which are substantial. Attempting to capture a verite feel can be tricky, because there's significant risk of having the seams show. One awkward performance or poorly-staged scene can blow the entire illusion. To its credit, Alien Outpost (directed by Jabbar Raisani) mostly pulls the feat off. Once or twice in the finale, however, an effect looks a little too digital, which undermines the approach. There's also scant character development in the movie, so it's hard to achieve any sort of emotional engagement. Getting to know the soldiers better would have created more investment in who lives and who dies. Alien Outpost works best as a combat picture. There are enough pyrotechnics and human/alien fight scenes to mostly hold your attention, although the film never delivers a whole lot more than that. Supplementary materials on Scream Factory's Blu-Ray start with audio commentary from director/co-writer Jabbar Raisani and director of photography/co-writer Blake Clifton. They discuss the logistics of the shoot, as well as other aspects of production. There are also sixteen minutes of cast and crew interviews, which provide more insight into how the film's effect was achieved. Last, but not least, are just over three minutes of deleted scenes that provide just a bit more of what's already in the movie. Alien Outpost is unrated, but contains language and graphic violence. The running time is 1 hour and 30 minutes.